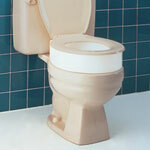 The short toilet aid is ideal for persons with limited range of motion. The toilet aid is plastic coated to protect the skin and measures 10 in long. Easy to clean.